Evolving fashion trends have brought a revolution in the dressing sense of people across the world. 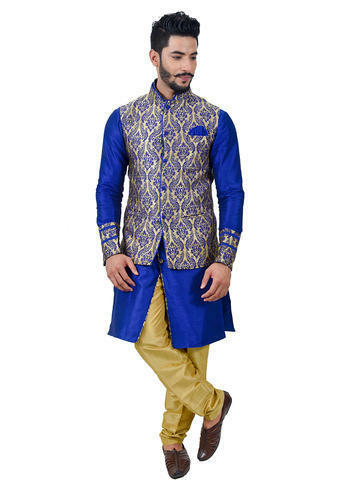 This goes for traditional and western wear outfits in both men's and women's wear category. In men's wear, there are a myriad options to choose from. 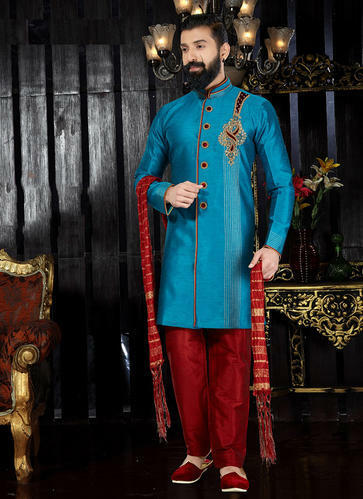 However, the conventional kurtas for men have stood the test of time and changing fashion trends to become one of the most favored Indian outfits. 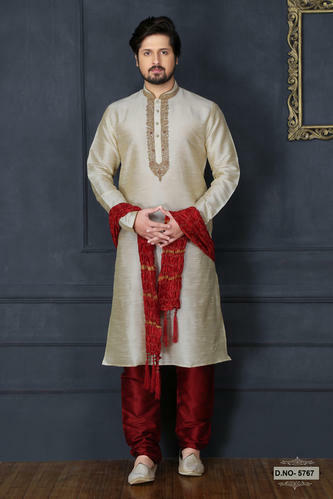 The Traditional Indian Wear.Kurta Pajama Catalog have banarasi silk fabric kurta with neck embroidery lacework.Its comes with art silk bottom.Kurta is a long loose shirt, the length of which falls below or may be just above the knees of the wearer. *Catalog No:8499 (Product Code: 81212-81226)(15 Designs Available In Different Colors). *NOTE - Stole, Mojri and any other accessories shown in image are for reference purpose only, It is not provided with product. If you need you can request it which costs extra. 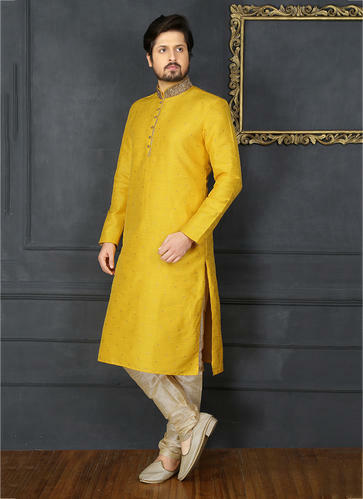 *Kurta is a long loose shirt, the length of which falls below or may be just above the knees of the wearer. 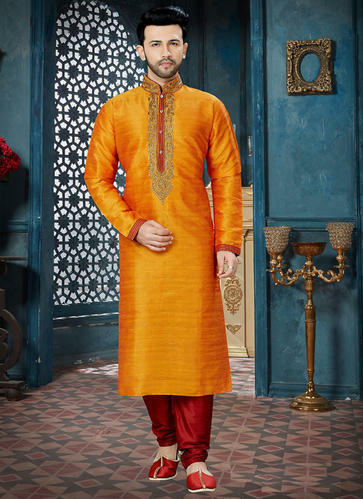 The Traditional Indian Wear.Kurta Pajama Catalog have Art Silk Banarasi Silk fabric kurta with embroidery lace work.Its comes with art silk bottom.Kurta is a long loose shirt, the length of which falls below or may be just above the knees of the wearer. *Catalog No:7026 (Product Code:66394-66403)(10 Designs Available In Different Colors). Packaging Details: International Standard Quality. 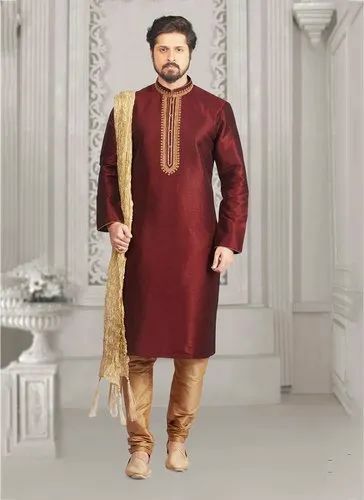 The Traditional Indian Wear.Kurta Pajama Catalog have jacquard silk fabric kurta withembroidery zari work.Its comes with art silk bottom.Kurta is a long loose shirt, the length of which falls below or may be just above the knees of the wearer. *Catalog No:7029 (Product Code: 66424-66433)(10 Designs Available In Different Colors). 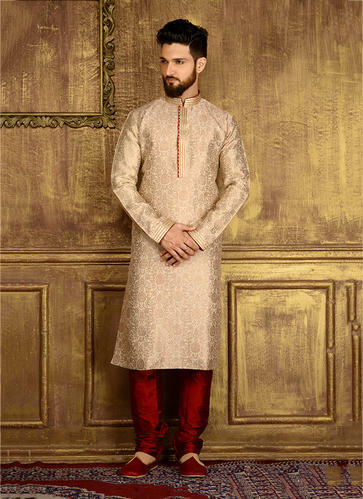 The Traditional Indian Wear.Kurta Pajama Catalog have jacquard silk fabric kurta with lace work.Its comes with art silk bottom.Kurta is a long loose shirt, the length of which falls below or may be just above the knees of the wearer. *Catalog No:7027 (Product Code: 66404-66413)(10 Designs Available In Different Colors). *Its Available in Readymade Size. 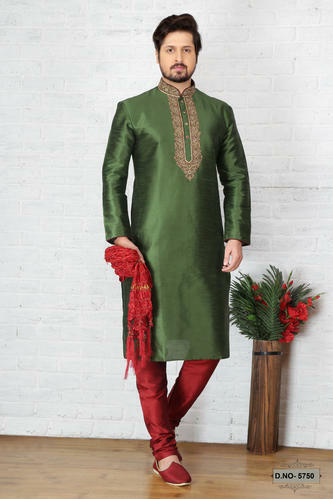 The Traditional Indian Wear.Kurta Pajama Catalog have art silk and banarasi silk fabric kurta with embroidery work.Its comes with art silk bottom.Kurta is a long loose shirt, the length of which falls below or may be just above the knees of the wearer. *Catalog No:8500 (Product Code: 81227-81241)(15 Designs Available In Different Colors). 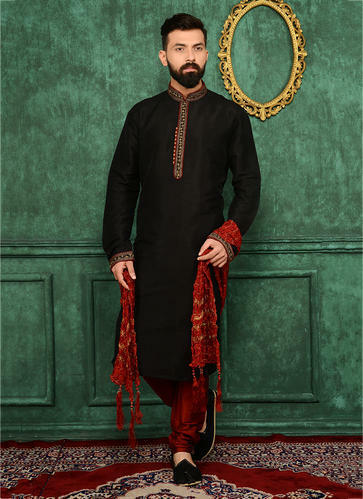 The Traditional Indian Wear.Kurta Pajama Catalog have Art Silk fabric kurta with Neck Embroidery work.Its comes with art silk bottom.Kurta is a long loose shirt, the length of which falls below or may be just above the knees of the wearer. *Catalog No:8502 (Product Code: 81257-81271)(15 Designs Available In Different Colors). *Catalog No:8501 (Product Code: 81242-81256)(15 Designs Available In Different Colors). *Catalog No:8503(Product Code: 81272-81282)(11 Designs Available In Different Colors). *Catalog No:8504 (Product Code: 81283-81293)(11 Designs Available In Different Colors). 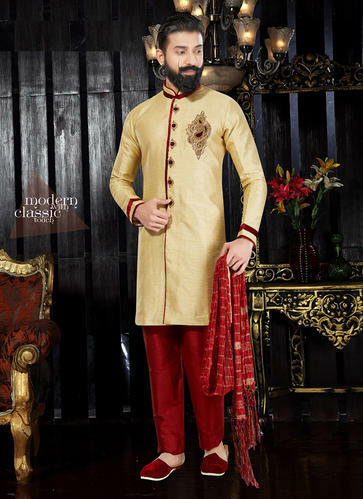 The Traditional Indian Wear.Kurta Pajama Catalog have different fabrics like Art Dhupion,Chanderi Silk,Banglori Silk and Banarasi jacquard kurta with Neck Embroidery work.Its comes with Dhupion art silk bottom.Kurta is a long loose shirt, the length of which falls below or may be just above the knees of the wearer. *Catalog No:10558 (Product Code: 99621-99649)(29 Designs Available In Different Colors). 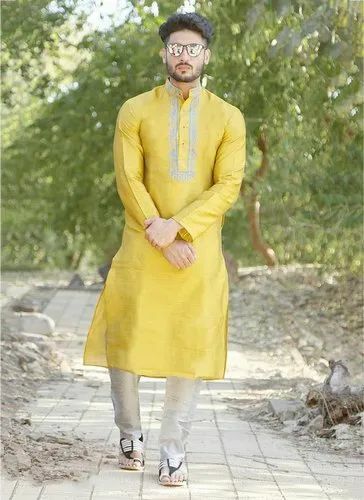 The Traditional Indian Wear.Kurta Pajama Catalog have Gichcha silk fabric kurta with Embroidery Patch work.Its comes with art dhupion bottom.Kurta is a long loose shirt, the length of which falls below or may be just above the knees of the wearer. *Catalog No:10559 (Product Code: 99650-99663)(14 Designs Available In Different Colors). 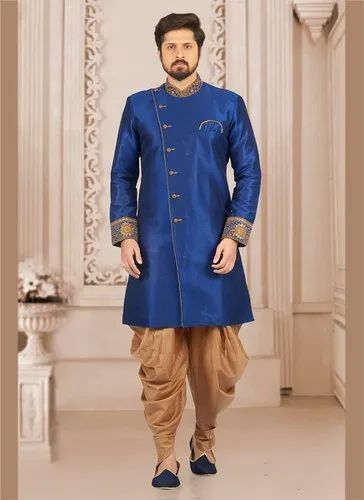 Short Kurta Pajama For Wedding.This Designer Kurta Pajama Catalog have Art dhupion fabric kurta with embroidery patch work.Its comes with art dhupion bottom.Kurta is a long loose shirt, the length of which falls below or may be just above the knees of the wearer. *Catalog No:10560 (Product Code: 99664-99677)(14 Designs Available In Different Colors). 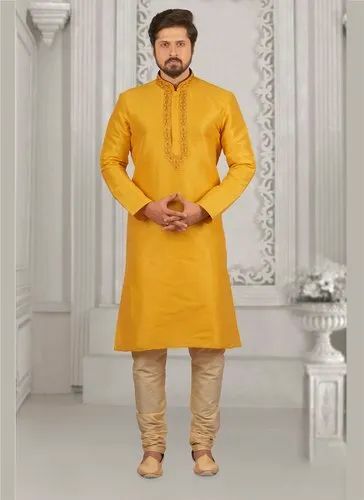 The Traditional Indian Wear.Kurta Pajama Catalog have Cotton Polyster fabric kurta with patch work.Its comes with Cotton Polyster bottom.Kurta is a long loose shirt, the length of which falls below or may be just above the knees of the wearer. *Catalog No:10001 (Product Code: 94795-94798)(4 Designs Available In Different Colors). 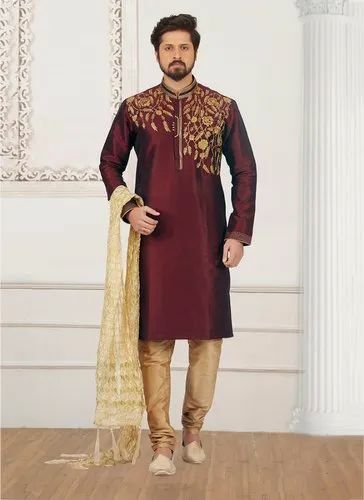 Designer Kurta Pajama Catalog have Art silk and Cotton silk fabric kurta with Zari work.Its comes with art silk bottom and Brocade Jacket.Kurta is a long loose shirt, the length of which falls below or may be just above the knees of the wearer. *Catalog No:10763 (Product Code: 102452-102461)(10 Designs Available In Different Colors). 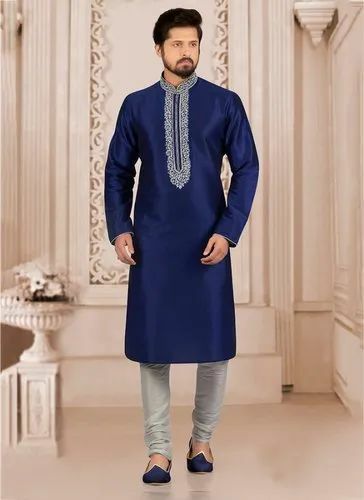 The Traditional Indian Wear "Kurta Pajama"Catalog have Art silk fabric kurta with Embroidery work.Its comes with Dhupion silk bottom.Kurta is a long loose shirt, the length of which falls below or may be just above the knees of the wearer. *Catalog No:10933(Product Code: 103891-103899)(9 Designs Available In Different Colors). 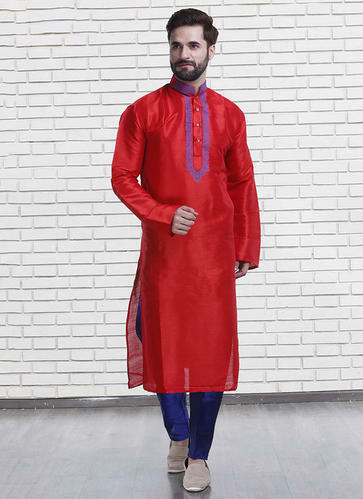 The Traditional Indian Wear "Kurta Pajama"Catalog have Art Banarasi silk fabric kurta with Embroidery work.Its comes with Dhupion Art Silk bottom.Kurta is a long loose shirt, the length of which falls below or may be just above the knees of the wearer. *Catalog No:11474 (Product Code: 108997-109011)(15 Designs Available In Different Colors). *Catalog No:11475 (Product Code: 109012-109026)(15 Designs Available In Different Colors). The Traditional Indian Wear "Kurta Pajama"Catalog have Banarasi Art Silk fabric kurta withNeck Embroidery work.Its comes with Dhupion Art Silk bottom.Kurta is a long loose shirt, the length of which falls below or may be just above the knees of the wearer. *Catalog No:11476 (Product Code: 109027-109041)(15 Designs Available In Different Colors). 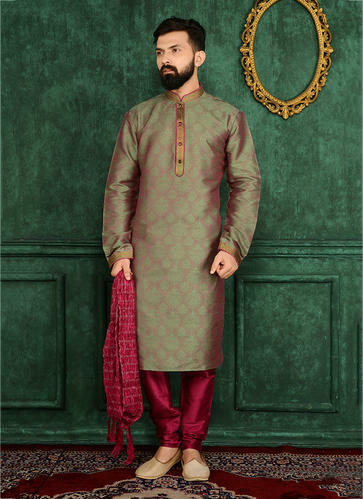 The Traditional Indian Wear "Kurta Pajama"Catalog haveBanarasi Art Silk fabric kurta with Neck Embroidery work.Its comes with Dhupion art silk bottom.Kurta is a long loose shirt, the length of which falls below or may be just above the knees of the wearer. *Catalog No:11477 (Product Code: 109042-109059)(18 Designs Available In Different Colors). 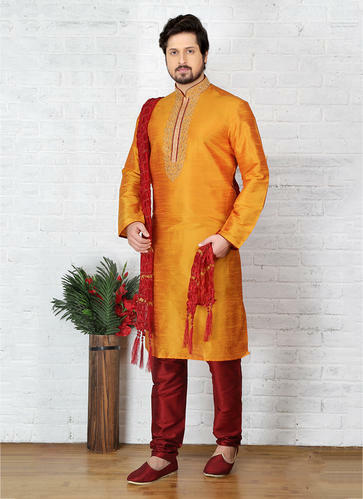 The Traditional Indian Wear "Kurta Pajama"Catalog have Banarasi ARt Silk fabric kurta with Embroidery work.Its comes with Dhupion art silk bottom.Kurta is a long loose shirt, the length of which falls below or may be just above the knees of the wearer. *Catalog No:11478 (Product Code: 109060-109077)(18 Designs Available In Different Colors). 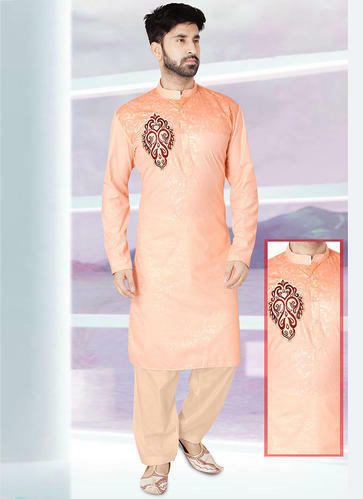 The Traditional Indian Wear "Kurta Pajama"Catalog have silk fabric kurta with Embroidery work.Its comes with silk bottom. 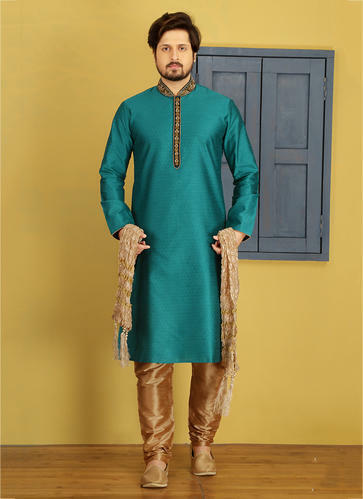 ~Kurta is a long loose shirt, the length of which falls below or may be just above the knees of the wearer. *Catalog No:11981 (26 Designs Available In Different Colors).